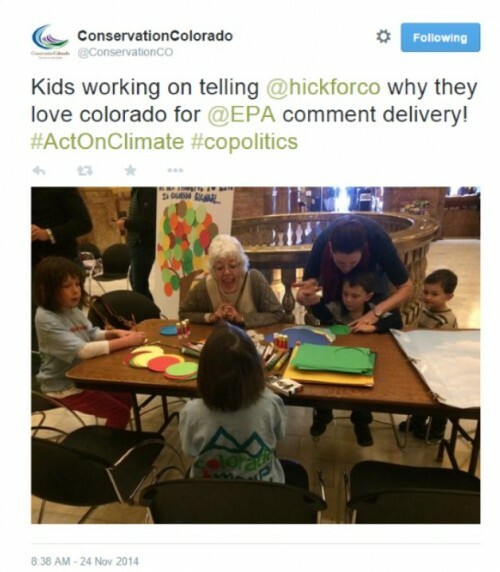 Conservation Colorado, a political organization dedicated to electing left wingers, today bragged on Twitter about how kids are “telling [Gov. John Hickenlooper] why they love Colorado for [EPA] comment delivery” at the Colorado State Capitol. The only problem is that at least one of the children in the picture that the group shared does not appear to be old enough to hold a crayon. We assume that is a parent or guardian helping him write (if not, that’s especially weird). The one standing next to him looks even younger. Want to engage kids in policy? Ok, sure, sounds good. But, forcing kids, even your own, to support a policy position by submitting a comment into the public record seems contrived at best. « LOST AND FOUND: IRS Finds Missing Emails, Will They Incriminate Bennet?